Image credit: Google Earth Street View. We continue with the series on the barrios of Batangas, and this time we look at the small western Batangas town of Tuy. As with the other articles in the series, the information has been taken from the documents required of Department of Education districts around the country in 1951 by the Philippine government to reconstruct local histories after important documents were destroyed during the war. The documents are among the digital collection of the National Library of the Philippines. Not all barrios are included. It is possible no documents were submitted for the missing barrios or, if there were, these had become eaten away by time before the NLP started digitizing them. It is also possible that some barrios did not exist yet in 1953, when the documents were submitted, and were still part of other barrios. The barrio was originally settled first by a large family named Rodriguez, which had a dozen siblings. They were soon followed by the Hernandezes, Ramirezes, Alicaways, Andulans, Lopezes, Gomezes, de Sozas and Bautistas. According to folklore, this barrio’s name was taken from the name of a tree that was as big as a “huge mango tree.” That tree was supposed to have grown “by the side of a stiff pass going to Balayan from Tuy.” The said tree was supposed to have been swept away during a great flood in the nineteenth century. Was this tree the Pacific walnut, known in Tagalog as dao2? During the Spanish era, cotton was among the main crops produced by the farmers of the barrio. “When the cotton was in full bloom, the fields looked very white for they were plentiful.” At the outbreak of the Philippine Revolution, inhabitants of the barrio fled to the mountains for safety. Thus, when the Spanish soldiers arrived, they found the barrio abandoned and burned all the houses in it. The cotton fields in Dao turned white when the plants were in full bloom. Image credit: History.com. This barrio being a low-lying plain bounded to the east, south and west by rivers, from which its inhabitants drew water for the household and to water the fields and from which they caught fish and shrimps, it was inevitable that it would be so named. The barrio folks lived in ease and comfort. The original settlers of the place were the Madrigals and the Dimapindans. Before the arrival of the Spaniards, this barrio was thickly forested and was considered a hunting ground for deer and wild boar. When the Spaniards came, they cleared the area and built a road that would serve as a link to the town of Tuy. 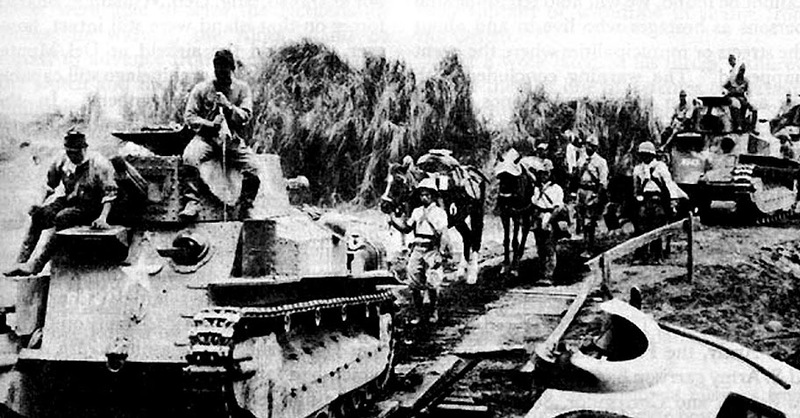 Guinhawa was left virtually untouched by World War II, and the most its inhabitants saw of it were glimpses of Japanese soldiers on their way to other towns in the province. Guinhawa was practically untouched by World War II. Image credit: Wikipedia. According to folklore, the barrio’s name was given after a local datu named Lao repulsed the attack of a rival and his troops. After victory, Lao’s men started shouting “Hindi magahis!” From context, we presume the phrase meant either “cannot be attacked/assaulted” or “cannot be conquered.” One of the barrio’s sitios, Munting Coral, was thought of as something of a “Little Taal” because most of its inhabitants had the same family names as the people of Taal and they even spoke with the Taal accent. This barrio’s original families were the Carandangs and the Anchorezes. Aside from Taal, settlers arrived in Magahis from several towns in Cavite, attracted as they were by the rich fields in the barrio. The opening of a sugar central in Nasugbu also attracted more immigrants. In World War II, Magahis was considered an ideal hiding place for guerrillas. Here, they frequently met to discuss strategies and moves against the Japanese Army. The barrio at considerable risk also hid an American soldier from the Japanese soldiers who were looking for stragglers. One sitio of Magahis used to be known as Little Taal. Image credit: University of Michigan Digital Collections. Malibu was supposed to have originally been part of an adjacent barrio called Palingkero. According to folklore, the barrio was so named after this one day when a hundred or so of its inhabitants all went fishing at the river. Although there were so many people fishing simultaneously, each of them still went away with bountiful catches. From that day on, the place became known as Malibu, or by the thousands, “libu” (or “libo”) meaning thousand. In the mid-nineteenth century, a man from Balayan named Felix Fronda was supposed to have acquired land in the barrio and started clearing it for farming. His descendants would continue acquiring more land and clearing these. As time went by, with more lands being cleared, new settlers started to arrive. In World War II, two young men from the barrio named Arcadio Pedraza and Pedro Punongbayan were called to enlist by the Philippine Army. Both participated in the infamous death March and died of hunger and disease at the Japanese concentration camp in Capaz, Tarlac. There was a time when there was a flourishing industry in the barrio for tanning cowhide, and the barrels that were used to store the water and lime used for tanning were called “toong.” Thus, the barrio were named after these. When the Spaniards arrived, they introduced the planting of sugarcane, which were then crushed using a primitive contraption turned by humans or animals. During the Spanish occupation, two of the barrio’s lieutenants were sentenced to death by hanging. Another was killed during the early years of the American occupation, likely for interaction with the Filipino freedom fighters which were then called the “Insurrectos.” In World War II, guerrilla troops under the group Fil-American Irregular Troops (FAIT) operated from barrio Toong. Sugarcane was introduced to Toong by the Spaniards, and these were crushed using primitive machines like the one above. Image credit: University of Michigan Digital Collections. In the 1950s, hardly anyone referred to the barrio by its name but instead called it Obispo after the river that borders it to the north and west. Its name was derived from the Tagalog “tuyong-tuyo,” meaning very dry, in reference to the Atga River which becomes dry during the summer. The barrio was originally part of two barrios named Acle and Putol but became separated in 1916. When a provincial road was built close to the barrio, settlers from other barrios moved to Tuyon-tuyon. Wealthy families from Taal, Lemery and Balayan also purchased large tracts of land in the barrio and brought tenants to it, increasing the barrio’s population. Most of these immigrants worked in the sugar industry. 1 There was, even in the fifties, another barrio named Tuyon-tuyon. 2 “Dao,” online at Philippine Medicinal Plants.